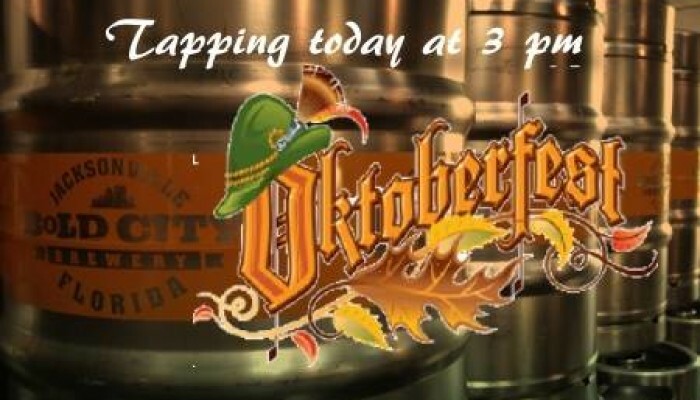 Join us today at 3 pm for the tapping of the 2013 Bold City Oktoberfest! … Imagine that you have strapped on your dirndl and slipped on your lederhosen … and then come to Bold City Brewery to let your polka hang out! This year’s is a true Marzen, much different than last year’s version, which was a Dunkel Marzen. For comparison reasons and the popularity of last year’s Oktoberfest, we saved a few kegs of the 2012 Oktoberfest and we will be tapping those today at 3 pm, as well. This year’s Oktoberfest comes in at a sessionable 6% ABV.